Cuba's westernmost province of Pinar del Rio boasts two of the six UNESCO Biosphere Natural Reserves on the Cuban archipelago and contains the Valle de Viñales or Viñales Valley, also declared a World Landscape Heritage Site by UNESCO for its strange and stunning mogotes, round-topped, cliff-like hills covered with lush vegetation. Pinar del Rio is also the region where the country's, and arguably the world's, finest tobacco is grown. The Pinar del Río province contains one of Cuba's three main mountain ranges, the Cordillera de Guaniguanico, divided into the easterly Sierra del Rosario and the westerly Sierra de los Organos. These provide for a preponderance of fertile valleys, called hoyos, and the mogotes which much are essentially flat-topped buttes made of limestone and peppered by caverns and subterranean rivers. Along the coast there are excellent yacht anchorages, clear waters,spectacular corals and great expanses of empty white-sand beaches. Also scenes of oxen tilling red-earth fields and cowboy peasants, called guajiros, on horseback, are commonplace. About 20 kilometres from the Vinales Valley, off the northwest coast of Cuba, lies a cluster of tiny islands enveloped by thick jungles of tropical mangrove and bordered by fabulous white beaches. The most idyllic amongst these is Cayo Levisa. This small coral key off the north side of Pinar del Rio is part of the Archipielago de los Colorados, which sits in the Gulf of Mexico. It's known for its white coral beaches, thick mangroves, abundant seabirds, and seas rich in red snapper, sea bass, lobster, marlin, and other species. From the early 1940s, American author Ernest Hemingway had a fishing camp on Cayo Paraiso, a smaller coral island 10km east. Recently an exclusive tourist resort has been built on Cayo Levisa. There are 23 diving points on the island shelf, which has numerous coral formations, an ideal location for snorkelling. At the westernmost tip of Cuba, in the Pinar del Rio province, you can find one of the most virgin natural zones in the Cuban archipelago. The Guanahacabibes Peninsula region, due to its treasures of flora, fauna, and for its sea and terrestrial landscapes, has been a Biosphere Reserve as declared by UNESCO since 1987. On the coast of the "Reserva de la Biosfera Península de Guanahacabibes" are many beautiful white sandy beaches. And off the coast are extensive coral reefs. All of which are some of the most pristine in the world. Visitors are able to experience dozens of dive sites off the southern shores, from Maria La Gorda International Diving Centre, and now dozens more off the northern shores, from the new Cabo San Antonio International Diving Centre. Birds like Cartacuba, Tocororo, Sijú platanero, Zunzuncito, among many others, are to be found in a migration corridor of more than 50 species flying from north to south and vice versa, and stopping in the coastal lagoons and wetlands. Guanahacabibes also supports 35 species of reptiles, and is an important habitat for iguanas, majaes and other reptiles. N.B. Biosphere reserves are sites recognized under UNESCO's Man and the Biosphere Programme which innovate and demonstrate approaches to conservation and sustainable human development. The 121,572 hectare "Reserva de la Biosfera Península de Guanahacabibes" has within it the 39,901 hectare national park since 2001 "Parque Nacional Península de Guanahacabibes" and the two strictly protected nature reserves since 1963 "Cabo Corrientes" and "El Veral". The hilly La Palma municipality is located in the north of the province of Pinar del Rio. It has an area of 622 km². 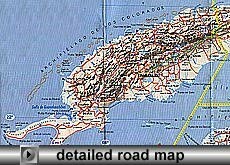 It borders to the north the Gulf of Mexico, to the south the municipalities Consolacion del Sur & Los Palacios, east of Bahia Honda, along the San Marcos River, & also borders the municipality San Cristobal, & West with the municipality to Viñales. There is archaeological evidence, at more than 28 sites, that La Palma town was previously inhabitated by Aboriginal Indians. The district is characterised by flat fertile areas, only a little above sea level, & by quite dramtically steep-sided hills upto 500m high. The limestone hills have extensive cave systems. The area has a good reputation for the production of high-quality ceramics and woven work and it is famous his Neoclassical buildings. Although there is a fair amount of traffic and activity on the streets, the city gives the impression of being geographically isolated as well as a little behind the times. Among the main places to visit are the Provincial Museum of the History of Pinar del Rio, Museum of Natural Sciences, Tobacco Museum and Calle Jose Marti. Puerto Esperanza, 6km north of San Cayetano and 18km north of Rancho San Vicente de Vinales, is a sleepy little port often visited by yachts sailing around the country. The locals swim from a long pier pointing out into the bay. Just west of the Sierra de los Rosario, in the foothills of the Sierra de los Organos, you'll find La Güira National Park and San Diego de los Baños. La Güira is a small park that is a favorite stop for bird-watching tours and general sightseers. San Diego de los Baños is a tiny town built on the edge of a lovely river. The well-gained fame of San Diego de los Baños dates back some centuries ago, exactly to 1632, when a fortuitous event involving a slave brought to light the almost miraculous properties of its springs. The anecdote - almost a legend - about Taita Domingo, a slave whose masters had granted him his freedom because he was seriously ill with skin lesions, and who wandered around the farm, has survived the passing of time. During one of his walks, Taita Domingo discovered a spring later called La Gallina, which waters relieved and even cured his ailment, thus marking the beginning of a new era for that eastern Cuban region. Amid fields of big green leaves ripening in the sun and plantations covered incanvas sheets for the all-important cigar-wrapper leaves stand gorgeous wooden barns called casas del tabaco. Here leaves are hung on poles with a needle and thread to turn from green to brown. Fishing is the main economic resource, and is the gateway to the Guanahacabibes peninsula, a UNESCO Biosphere Reserve. The municipality of Sandino has 40184 inhabitants and a population density of 23.5 inhabitants per km2. It is famed for its mogotes, large limestone formations which date back to the Jurassic period, is one of the most beautiful spots in Cuba. This villagey town is surprisingly spruce, with a fetching arcaded main street and lovely rustic scenes down the back lanes, the tranquility of the place and the friendliness of the local people are as seductive as the scenery, there are walks to do, horses to hire and tobacco farms and caves to visit.